Refillable water bottles are tops in terms of environmental friendliness, but there’s still a big market for plastic bottled water. In an effort to move toward all-recycled plastic packaging in the next few years, British supermarket chain Co-op recently debuted water bottles made of 50 percent recycled plastic. But there’s a drawback: The water bottles look kinda dirty. Co-op knows this. Announcing the new bottles on the company’s blog, the supermarket says “this trial will enable us to see if our members and customers are ready to ditch aesthetically pleasing packaging for more environmentally friendly packaging.” Co-op goes on to state that adopting this type of plastic across all its products could save 350 tons of plastic annually, but it would result in bottles that look darker and “cloudier” than normal. “Suppliers are working hard to make the bottle clearer. 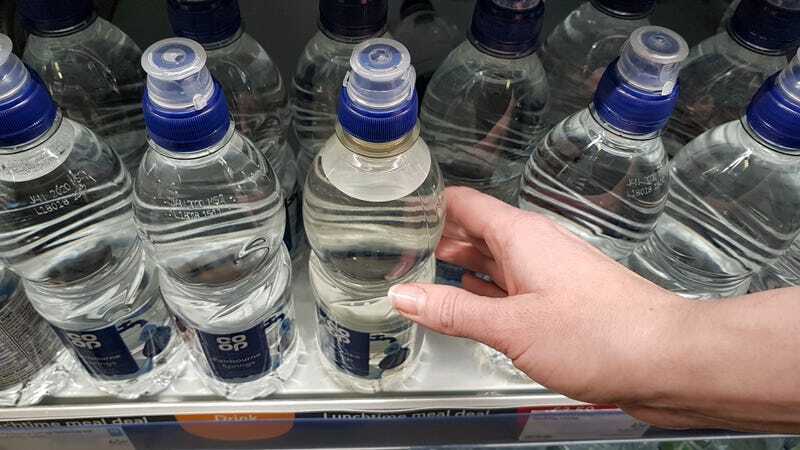 In the meantime, our bottles will wear this greyish colour which I see as a ‘badge of honour’–we are part of the market for recycled products, and we are proud of that,” says Co-op’s environmental manager Iain Ferguson in a statement. Whether shoppers feel the same way echoes the “ugly fruit” conundrum: Ostensibly, consumers would like to chose environmentally-friendly foods. But are we willing to make a trade-off for aesthetics? Dirty-looking water is especially tough to swallow—literally—because it’s a substance that we are absolutely conditioned to insist is clean and pure. The market for Brita filters, reverse-osmosis contraptions, and even that “pure water” crap is all predicated on our obsession with water that’s as clean as possible. Tolerating a bruised banana is one thing; overcoming the psychological barrier and ingesting water that doesn’t look clear is a bigger leap.